#6 -- Pro-Abortionist: "I was a tadpole in my mother's womb"
#4 -- Fighting Abortion in Lafayette: "You have a good and noble cause"
#2 -- Pro-Life Tour: "Hope in the midst of sin and chaos"
As the debate over the issue of abortion continues to divide the nation, a group of young TFP volunteers gathered in New Orleans, Louisiana, to begin a ten-day tour in defense of the sanctity of innocent human life. They will brave the sweltering heat, traveling to cities in Florida, Alabama, Louisiana and Texas. Their road trip -- commonly called a caravan -- has been entrusted to the powerful patronage of The Three Archangels. What happened on the first day of their tour? Leaving bright and early on July 20, the caravan arrived in Mobile, Alabama, in time for lunch hour traffic. 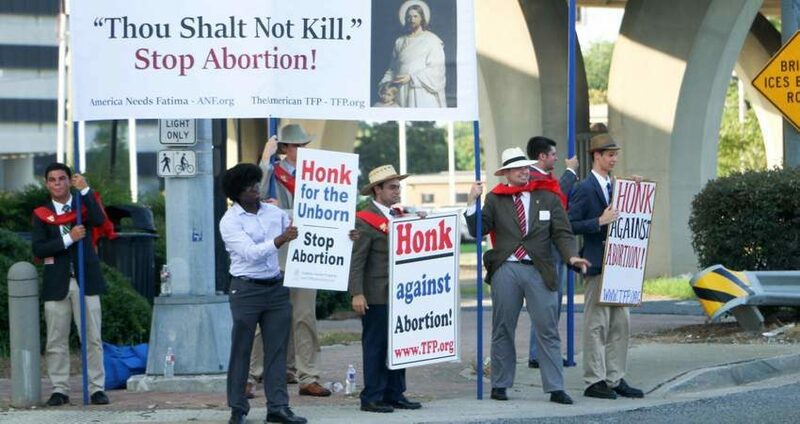 In classic TFP style, they seized the attention of the public with "honk for the unborn" signs and the unmistakable sound of the bagpipes and pro-life slogans. The reaction of the public was excellent, with the intersections erupting in honks. And the opposition was sparse, which was good. A Catholic priest drove by twice and gave the campaign volunteers his blessing and offered words of encouragement. One of the most impressive reactions to the signs was from a pro-abortion driver who was waiting at the light in a turning lane. When he saw our sign, “Honk against abortion,” he gave thumbs down and shouted his opposition. At that moment, the TFP volunteer holding the sign turned it around to show the opposite side, which read: “Abortion separates children from parents forever!” Reading this, the man bowed his head and slowly pointed his thumb upwards. As the light turned green he honked his horn and drove away with a smile on his face. Though such instantaneous conversions are rare to see, it is a strong testament to the power of these rallies to change hearts and minds and eventually right the moral compass of our nation. As the young TFP volunteers continue to proclaim God’s Law in the streets, please pray that God will use them as instruments of His grace to touch more souls and bring about the much-needed conversion of America. Please help us sharpen our comebacks. How would you answer the pro-abortion slogan, "my body, my choice"? What is the best short answer? Can you please help us by posting your pro-life answer in the comments section below? Catholic University Recognizes Pro-Abortion Club. Join the Protest.